A few months ago, I decided it was time for a change in our family room. 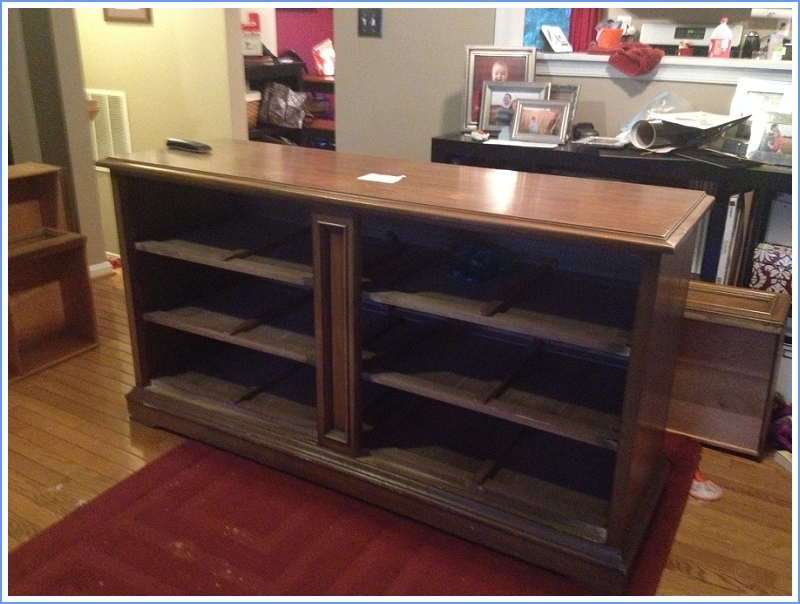 For the past 4 years, we have had our Haverty's TV cabinet in our front room. It is the same as the one in my parents family room, and we found it for half the original retail price on Craigslist. 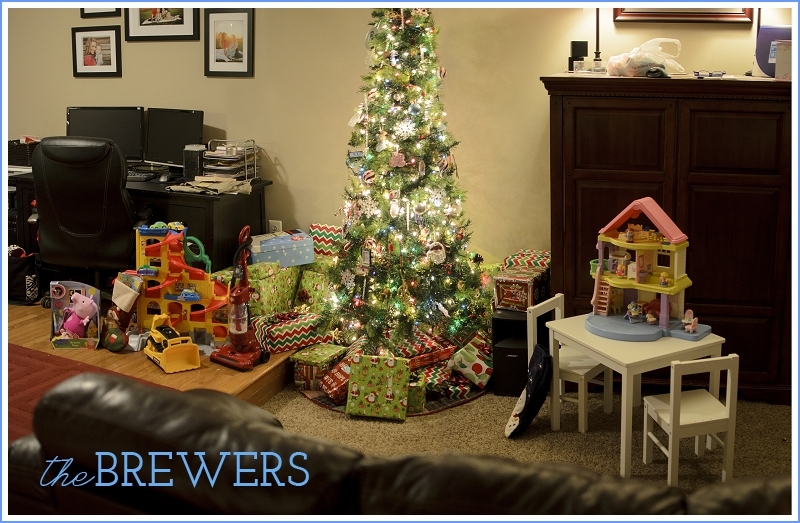 However, as our family has grown and more toys have found their way into our family room, I started to feel like the big unit was suffocating. Not to mention we bought a new couch, which is slightly wider than our previous one. 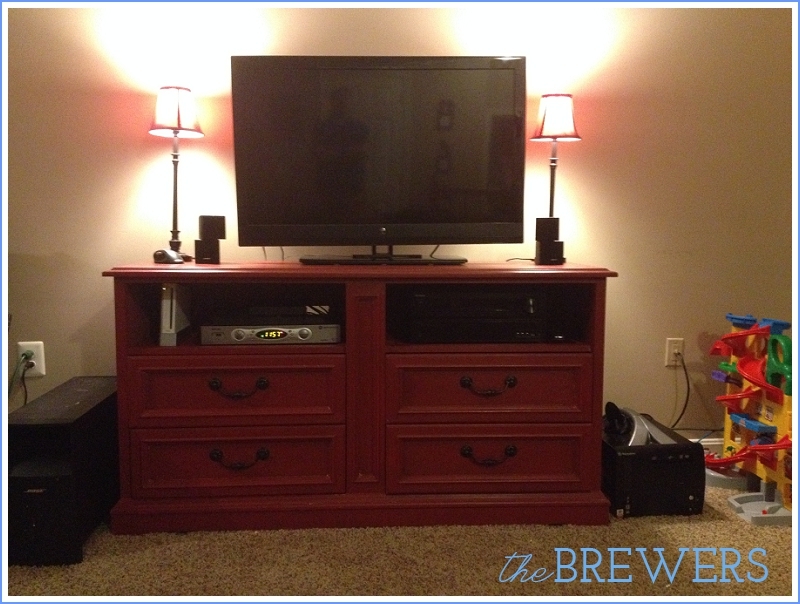 Although beautiful, I knew the entertainment center had to go. Now, let's skip over the fact that an originally priced $600 Haverty's SOLID WOOD entertainment center wouldn't sell on Craigslist, and we had to GIVE it away. I gave her the green light and we were sold for $53. Wahoo! My parents packed it up into their Ford Explorer on Memorial Day, and it found it's way to our house a few days later. I had big plans... RED. 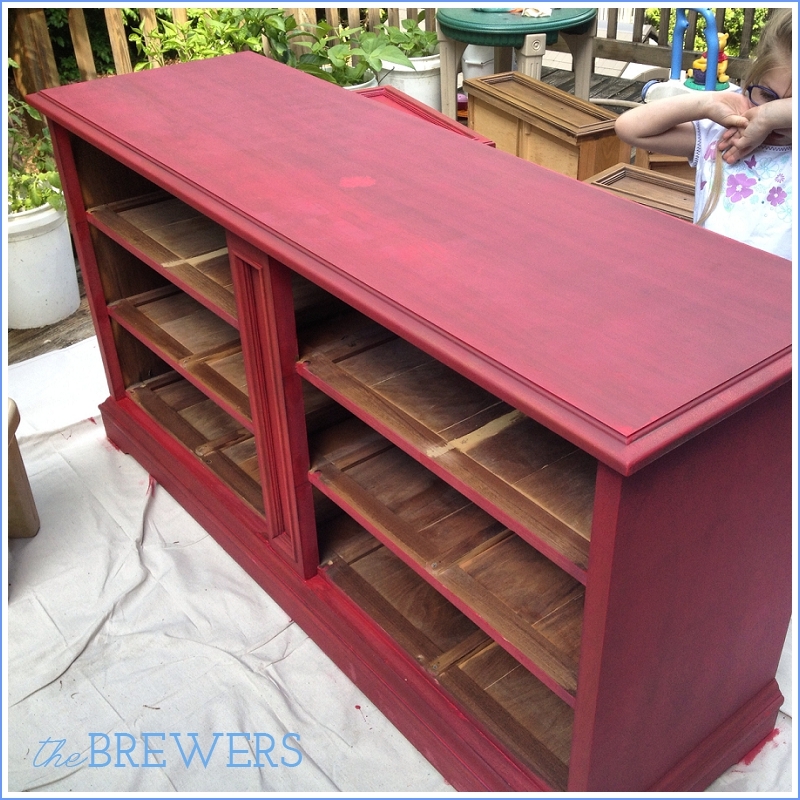 So, chalk paint is all the rage. I however, am relatively poor and couldn't stomach the cost of brand name chalk paint. 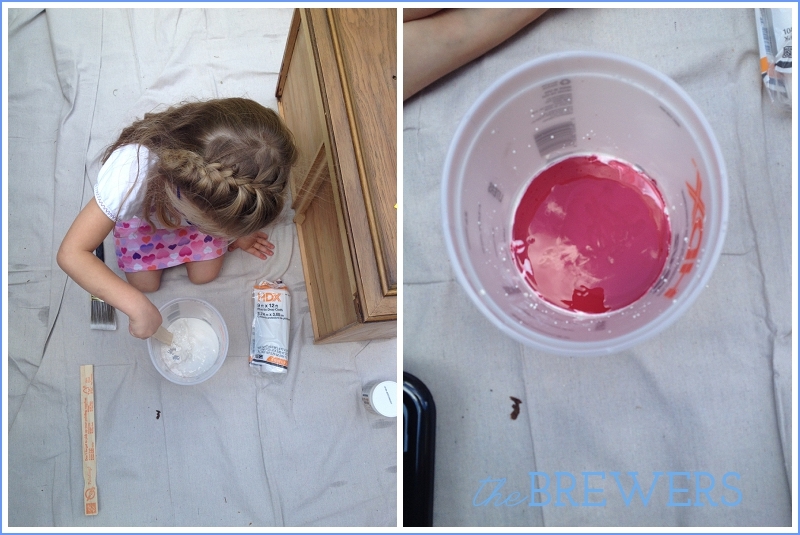 To Pinterest I went and found my own "recipe" for DIY chalk paint. That led to finding myself at Home Depot buying Plaster of Paris, a few sample cans of red paint, some brushes and rollers. The advantage to chalk paint is the absence of priming and sanding, although I did smooth out the top of the dresser for good measure. 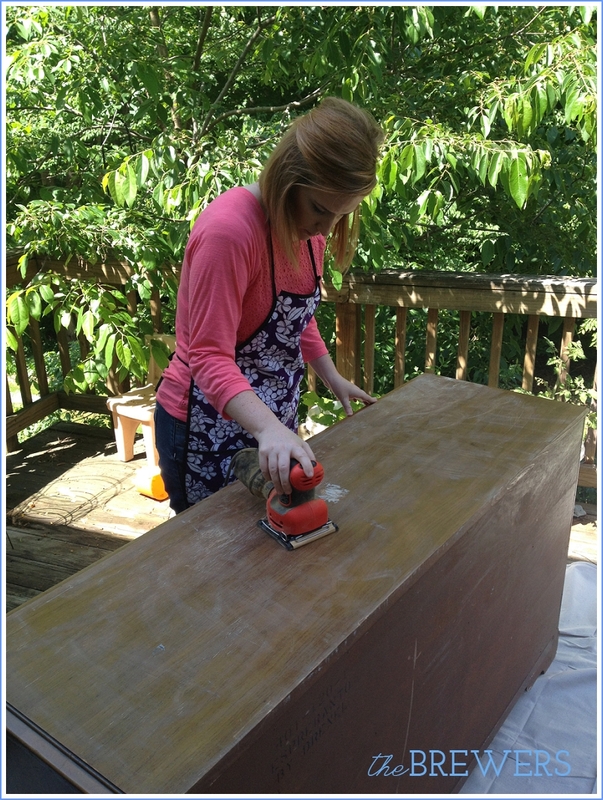 Once the dresser was whiped off with a rag and cleaned with water, it was time to make my paint, with the help of my lovely assistant. Now, if I were to go back and do this again, I would probably increase the amount of paint so it was a bit thicker and less of a sheer finish. However, if you really embrace the grain coming through, the original recipe will work great. After the first coat, I was in love! 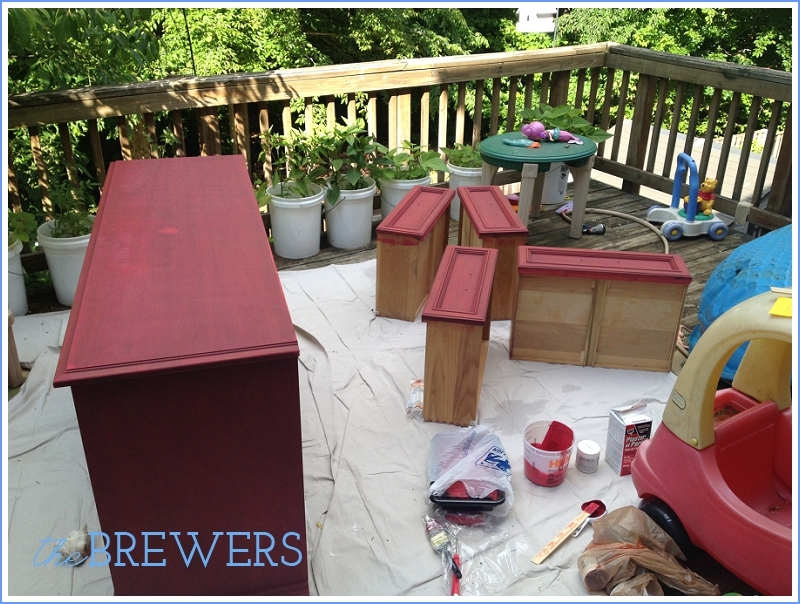 If you know me or you've hung around my blog since my countertop redo, you'll notice lots of red in my house. I knew this color would really make the room and unit pop against my neutral wall colors. Application was relatively simple. 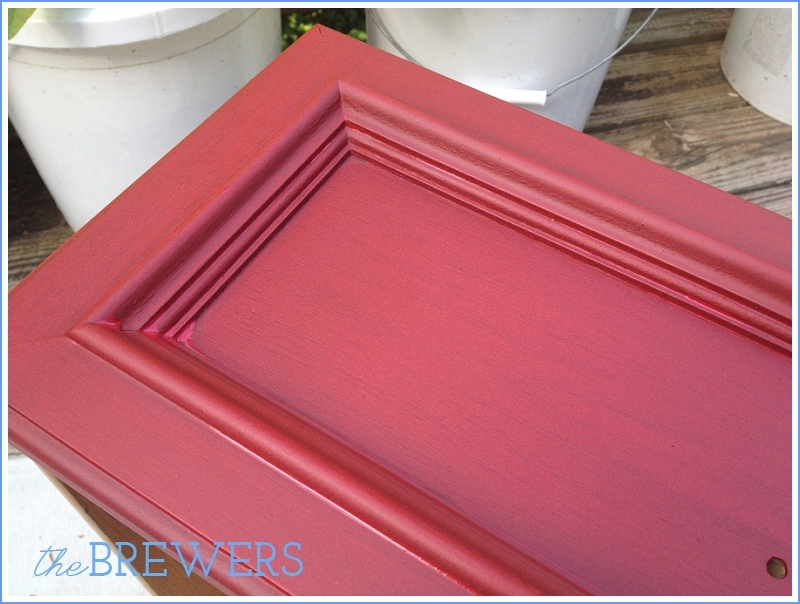 You'll find that chalk paint as a slight textured feel, like that of chalk dust. Duh. This is what helps the paint adhere without priming and sanding. In the end, I think I applied about 4 coats. Like I said, going back I would have increased the paint ratio so the amount of coats could have been lessened. However, I did and still kind of dig being able to see the grain on the dresser. 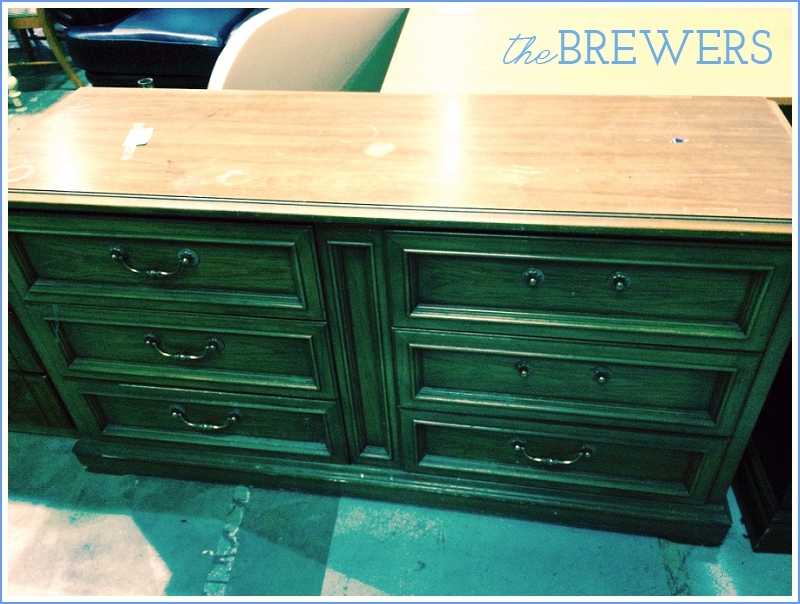 What's a furniture re-do without some hardware restoration? Nothing fits better into a dresser than the original hardware, and with some brushed nickel spray paint all of the pulls and handles looked brand new. Now, if you noticed in my original picture of the dresser, some of the hardware was missing. Luckily for me, two of the drawers were not going to be used, so I lucked out. Once the dresser was dry and pretty much ready for installation, it was time to switch out the items from one cabinet to the other. This was a pain, but it was made easier by labeling cords before they were pulled out, so we knew what cords belonged to what item and what auxiliary they were plugged into in the back of the TV and receiver. Adam cut long rectangular slits in the backing of the dresser for cords using a little electric jigsaw thingy, so we were ready to go. Huzzah! A horrible night picture, but alas, the unit was done! Having the space now open instead of the bulky cabinet sticking out from the wall and standing so high, it really opened up the family room and make it seem so much larger. The shelves inside the dresser worked perfectly. Luckily, there is wood between each drawer, so I didn't have to add any support for the DVR box and other electronics. 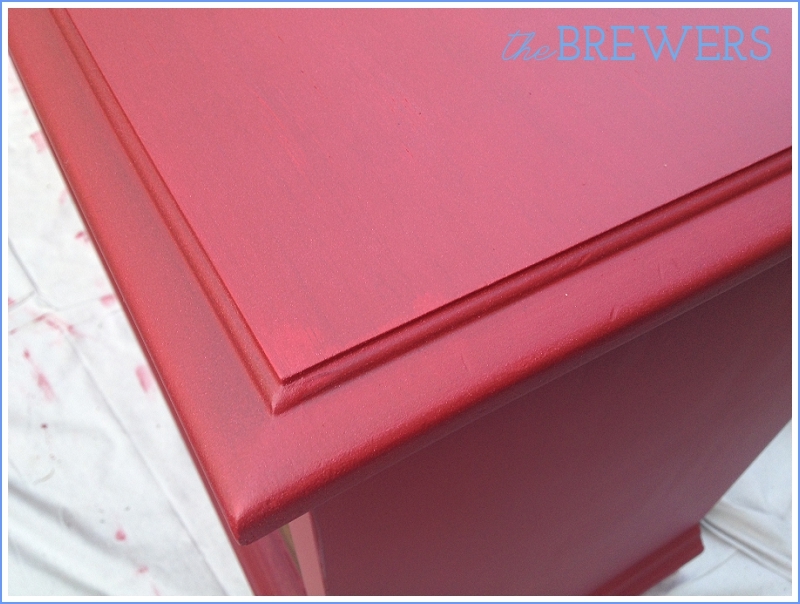 As I mentioned before, I would change my ratio of paint to water + Plaster of Paris if I did the chalk paint mixture again, which I would. I would not however, seal it with wax. I think the same results would have been accomplished using poly to seal and protect the paint (without wax or poly, the paint has a very matte, unfinished texture). The wax is very hard to apply evenly (you'll find similar sentiments on Pinterest) and I found that when it dried in any decent quantity, it dried into a very light, crusty texture. This happened in a lot of the creases of the molding in the front of the drawers and has now been removed with the help of a paper clip and baby wipes. Super annoying to have a brand new dresser look like it's in need of another paint job. Overall though, I couldn't be happier. The whole project was less than $75, and that's an investment I can get on board with!